Ladies flat 1" heel dance shoes for pure comfort! Receive your dance shoes WITHIN DAYS with FREE SHIPPING! Please check out our testimonials! Discount salsa shoes that have are flat heel dance shoes are so comfortable! 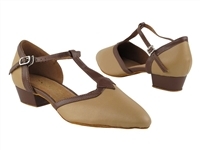 These shoes with a flat 1" heel dance shoes have the smallest flat heels that you can find on an authentic dance shoe, and are much more comfortable. Have both glamour and comfort with these discount salsa shoes. Flat heel dance shoes take pressure off of the sole of the sole of your foot, so you don't have the foot pain you would get from other dance shoes. Select from various colors and sizes among discount salsa shoes and discount ballroom shoes. Just because the heel is flat doesn't mean that the dance shoe has to be simple and not flattering. The 1" heel dance shoes are far from that! They are stylish and come in many colors with various glamour features. Be comfortable in your discount salsa shoes but yet look fantastic on the dance floor. 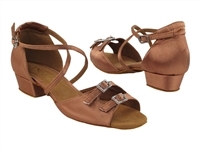 Enjoy these flat heel dance shoes for practice too! Have fun on the dance floor in these beautiful comfortable 1" heel dance shoes. And don't forget: FREE SHIPPING on ALL FLAT HEEL DANCE SHOES!